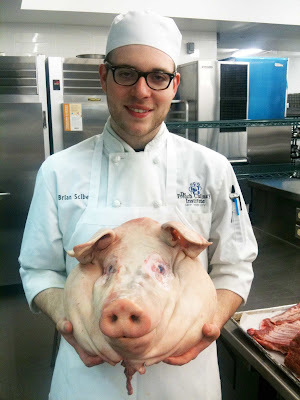 The following video highlights the pig-filled adventure I took in the spring of 2011 as part of my menu project in the Classic Culinary Arts program at The FCI. After tasting the delicious pork from a Berkshire hog, I was compelled to find out what sets these animals apart from the pork I grew up eating. My search began in Brooklyn, New York, at Heritage Foods USA, where I was allowed to intern for a month in exchange for half of a 100 percent Berkshire hog and a trip to their partner Paradise Locker Meats in Trimble, Missouri. I set off to spend some time with the people who raise and slaughter the pigs that I had become so fascinated with. Upon my arrival, I was welcomed into the home and business of Mario and Teresa Fantasma, owners of Paradise Locker Meats. There I was shown their immaculate and fully thought-out facilities. From outdoor holding pens with automatic water dispensers and misting fans to the remarkably clean kill floor, the family operated meat locker has it all. What I was most impressed by was the process in which the animals are slaughtered, cleaned, and broken down. The six-person crew works systematically to ensure that each animal is handled with respect and that the requirements of their Humane Slaughter Certification are met. Later, I was able to tour Norton Farms in Plattsburg, Missouri, where third generation pig farmer Eric Norton breeds a variety of hogs, including Berkshires. The Norton Farm spans 5,000 acres of outdoor pasture and crops, where they raise roughly 2,000 hogs at a time. Throughout their property, I saw hundreds of pig huts, which Eric told me needed to be lined with fresh straw every other day during the winter in order to keep their outdoor pigs warm. Hearing of Eric’s dedication to raising these animals gave me that much more motivation to get back to New York City, so I could honor the animal and all the hard work required to raise it with my cooking. For my menu project (something all culinary students are require to complete toward the end of their schooling), I prepared an entire meal showcasing various parts of my hog. Brian Scibetta will graduate from the Classic Culinary Arts program on August 3rd, 2011. He plans to begin work with a master butcher to further hone his butchering skills. Brian also hopes to open his own restaurant with an ever-changing charcuterie-based menu that is dictated by what local farmers are able to offer. Absolutely spectacular! Way to go, Brian. It was delicious as well. What’s On Your Hot Dog?